As crafty people we often pride ourselves of living besides the mainstream, not prone to consumerism, we feel a bit more independent of the big corporations and are less prone to fall for the next plastic thing that comes our way with a promise to make us happier or more beautiful. But then we don’t live in a bubble, and we do consume all the time. As was brought home to me last week. A few days earlier the new spring and summer edition of knitty went public. For those of you who don’t know, knitty is an online knitting magazine with all free patterns. When I saw that it had come out I went over and had a look. Now, the first thing I always look at is knittyspin. That’s the part of knitty about spinning, and about patterns made with handspun. And then I saw Tappan Zee. It’s a short-sleeved cardigan with a little lace around the yoke. I looked at it and thought, “I have to have this!” I looked at the requirements for the yarn, found that I didn’t have anything in stash that was suitable, went over to an online fiber shop, ordered 400 grams of merino-silk top, threw in another 300 grams of assorted merino for sock yarn, printed out the pattern, and started waiting. And that was the moment it hit me. This is insane. I felt that I absolutely had to print out the pattern this instant, when first I would have to wait for the fiber to arrive, then I would have to spin it, ply it, wash it, and only then could I start knitting. I won’t be needing the pattern for another four weeks or so. The only thing I need earlier is the specifications of the yarn I have to make for it. But I absolutely felt that I needed the pattern to sit there, right in the middle of my desk. Now, I have to add that I made a little pact with myself not to buy any more fiber until the 400 grams I already have sitting here are all spun up. I’m a little fed up with the way that there’s yarn everywhere in my house, leaping at me from unexpected places. I just finished spinning the yarn I bought last June, and am slowly starting to inch my way through some of what I bought last September. I’m not quite sure but since last summer I have spun about 800 grams of fiber. I still have 500 grams sitting around here (See how that became 100 grams more over the last two sentences? That’s because I remembered the other fiber I still have. ), and then I went out to buy 700 more grams just because I had seen a pattern for a little orange cardigan in a magazine. By my own estimate once that fiber arrives I will have enough fiber here to keep me spinning for the next year or longer. So, what started this? For one – as you all know – I can’t resist anything orange. If that cardigan hadn’t been made of orange wool I probably would have thought, “Oh, that’s interesting but I don’t need a pattern for it, I can make that myself.” and I would have put it aside because yoke sweaters don’t look that good on me, and I never wear short sleeved cardigans. But since it is orange, and the model has pink hair – I couldn’t resist. Well, I could have if I really had wanted to but I didn’t want to. Also I really need a cardigan or two. One of my go-to cotton cardigans is starting to look old and ratty, no surprise if you know that I bought it in 2003, and I wore it almost constantly since then. On the other hand a merino and silk cardi will probably be too hot. But maybe the short sleeves will help. The other thing is that despite my deeply felt cardigan shortage I do have a handspun cardigan and a handknit sweater sitting here that are almost finished. I only need to weave in the ends and sew on some buttons. These sweaters have been sitting here for months, and I haven’t managed to finish them despite my desperate need for more cardigans. So, to be frank, I really didn’t act in any way sensible when I ordered all that fiber. I had this “I want that!”-impulse, and acted upon it. And it’s that same impulse that makes us buy yet more shoes, or three dozen skeins of sock yarn even thought we could insulate our houses with the yarn we already have sitting around. It’s not the most mature thing to do. 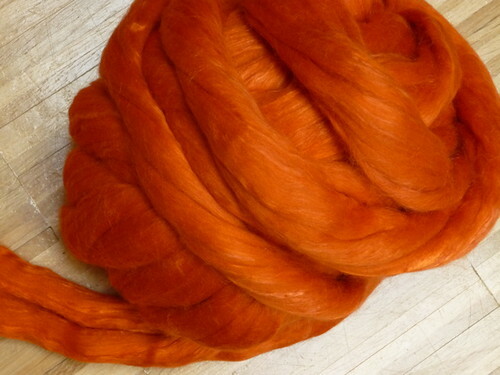 I’m still okay with my decision, and I did start spinning that merino-silk as soon as it arrives. My impulse cost me about 25 Euros, and I will make something out of that fiber for sure. But I have to see to it that I don’t give in to the Want too often. Giving in to the Want once in a while is a good thing and can make us happy. Giving in to it all the times is unhealthy and makes us unhappy. Und der erste Schritt ist, zu bemerken, daß einen das Nachgeben unglücklich macht. Wenn einem das bewußt ist, kann man ja gezielt was dagegen tun. Warum? Daß es das nächste Mal wieder Spaß macht, seinen Bedürfnissen nachzugeben. Kunst ist es, wenn einem die Gratwanderung immer gelingt. Mir gelingt sie nicht immer. So what!?! Das ist menschlich. Ich bin auf jeden Fall sehr gespannt auf Deine “Spinnereien” und auf “Tappan Zee”. That is a beautiful fiber, and the pattern is, too. I can’t imagine being too warm in that. I’m not much of an impulse buyer. Oooooh ja… das kennen wir alle nur zu gut, hm? Aber schön zu hören, dass du dich kontrollieren kannst, und nicht, sagen wir mal, kurz zur Strickwarenzentrale gehst und mit 20 Metern Ripsband heim kommst, weil es auf die ganze Rolle ja _Rabatt_ gibt und du eh 14,20 Meter brauchst. Mehr oder weniger. Und ich bin gespannt auf deinen Tappan Zee! Der hat mich auch schon angelacht, obwohl ich Strickjacken hasse. Muss an den pinken Haaren liegen. Aber ich werd mich wohl mit den Twisted Socks begnügen.